Three Cheers for One-legged Jack! Last week, we posted our first examination of inaccuracy in the Press & Journal. Today, we wind the clock back to May and present one which is a bit simpler to get and serves to illustrate the depths to which standards at the paper have plunged. Amazing! 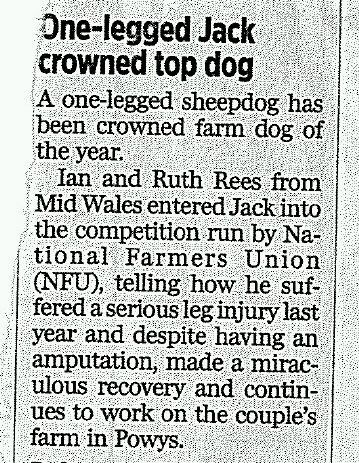 Quite an achievement for a one-legged dog to keep mobile let along continue to not only put in a shift down on the farm but win the prestigious NFU Farm dog of the Year award. Perhaps this peculiar pooch pogos around the parks of Powys? Far from being one-legged (a figure used twice in the P&J piece), Jack is in fact three-legged having lost one leg following an injury as correctly reported by the BBC on 4th May 2011. Jack’s achievements are remarkable and we salute this brave dog who is indeed a worthy recipient of his award. We are, however, concerned that the P&J editorial team allowed this story to go to press. Now while we don’t expect everyone to be au fait with all the details of commercial aircraft as discussed in our previous post, we would hope that the journalists and editorial staff of the Press & Journal were somewhat familiar with canine anatomy. Especially in a paper like the P&J that contains significant agricultural content. Even if they don’t have a dog, they’ve probably seen one and should have some idea of how they move. If the editorial standards at the P&J are so lax that they can’t get the number of legs on a dog correct, how can we trust the figures they report for the costs of schemes like the CitySquare Project or the alleged level of support for and potential economic benefits of the Trumpton Scheme? This entry was posted in Aberdeen, media, newspapers, Trump, Union Terrace Gardens. Bookmark the permalink.